No music by Bizet was played at the Opéra until 1900, when the second act of Carmen was included in a soirée de gala. He twice nourished hopes of acceptance by the Opéra, first with Ivan IV in 1865, which was written originally for the Théâtre-Lyrique but not performed there, and second with Don Rodrigue in 1873, intended as a vehicle for Jean-Baptiste Faure, the leading baritone at the Opéra. The fire that destroyed the theatre in the rue le Peletier brought those aspirations to an end. Of ail Bizet’s many operatic projects Ivan IV would have been the most suitable for the large stage and ample resources of the Opéra. The large cast and offstage band were too much for the Théâtre-Lyrique at that time. Of Don Rodrigue there survives an extensive sketch which shows the vocal line throughout but almost no indication of the orchestral accompaniment. The fact that Bizet broke off the composition of Carmen (commissioned by the Opéra-Comique) in order to work on Don Rodrigue indicates how much importance he attached to the hope of seeing one of his operas performed on the most coveted of operatic stages. 1No music by Bizet was heard from the stage of the Palais Garnier until 10 November 1900, when the second act of Carmen was included in a gala night twenty-five years after its famous first performance at the Opéra-Comique. In 1907 the complete Carmen was performed there, and in 1959 it became part of the regular repertoire. Les Pêcheurs de perles has been performed at Covent Garden in London, at La Scala, Milan, and at New York’s Met, but never at the Opéra. La Jolie Fille de Perth has been staged at Covent Garden. None of these three operas were intended for such grand stages, for they belonged to the more modest theatres where they were first heard: Les Pêcheurs de perles and La Jolie Fille de Perth at the Théâtre-Lyrique, and Carmen at the Opéra-Comique. They [i.e. Bizet and Lecocq, who shared the first prize in setting this work for a contest promoted by Offenbach] should refine their ideas a bit, corne up with some fresh, agreeable melodies, and so by climbing up step by step they will get to the Théâtre-Lyrique, then to the Opéra-Comique, and then to the Opéra, that summit of musical Parnassus reached only by the great celebrities1. 3This was precisely the trajectory Bizet followed, at least to start with; he got to the Théatre-Lyrique with Les Pêcheurs de perles in 1863 when he was twenty-four, and ro the Opéra-Comique with Djamileh in 1872 when he was thirty-three. He had every reason to expect to reach the Opéra when he was about forty – which of course he never was. Meanwhile Lecocq, though six years older than Bizet, attained only the Opéra-Comique, and not until he was fifty-four. Ambroise Thomas had his first opera played at the Opéra-Comique, when he was twenty-six and his first at the Opéra when he was twenty-nine. Gounod got to the Opéra at thirty-two, with his very first opera Sapho, jumping all the preliminary career stages to cries of astonishment and outrage. 2 Charles Pigot, Georges Bizet et son œuvre, Paris, 1886, p. 64-65. 4The origin of Ivan IV, Bizet’s first work intended for the Opéra, is surrounded in mystery and confusion. Charles Pigot, Bizet’s first biographer, said it was composed after Les Pêcheurs de perles, completed, orchestrated, and accepted by the Théâtre-Lyrique, but was not performed. He ascribed it to the year 1865, and reported that Bizet destroyed it some years later2. This was accepted by all Bizet’s biographers until 1933, when Jean Chantavoine reported in Le Ménestrel that the autograph manuscript of the opera had been given to the Bibliothèque du Conservatoire by M. Sibilat, executor of the estate of Emile Straus, Bizet’s widow’s second husband. 6 Georges Bizet to Philippe Gille, October 1864, Paris, Musée des lettres et manuscrits, Bizet 93. 5Bizet himself said that the opera was commissioned by Carvalho, director of the Théâtre-Lyrique, immediately after Les Pêcheurs de perles, that is to say at the beginning of 18643. The earliest documentary record of the opera appeared in Le Figaro on 10 March 1864, which reported that Bizet’s Yvan le terrible [sic] would be staged at the Théâtre-Lyrique after Gounod’s Mireille, which was then already in rehearsal4. In October of that year Gounod reported that Bizet was hard at work on the opera5, and at the same time Bizet told a friend that he was planning to finish the score in February 18656. Although the last scene of the opera is not orchestrated, it is likely that Bizet all but completed the opera when he said he would, early in 1865. The autograph score comprises 936 pages. 6Since the production of Ivan IV was repeatedly postponed throughout 1865, matters came to a head in December when Bizet reported that the Théâtre-Lyrique had run out of money. He made up his mind to offer the work to the Opéra instead. It was, after all, a five-act opera with a large cast of solo singers, chorus and dancers, demanding resources that the Théâtre-Lyrique could not normally provide. We know from Berlioz’s Mémoires how brutally Les Troyens, which was intended for the Opéra, was cut down at the Théâtre-Lyrique for lack of sufficient money and stage facilities. Bizet submitted Ivan IV to Emile Perrin, director of the Opéra. This Ivan IV has more chance of succeeding at the Théâtre-Lyrique than at the Opéra. Being still young, to get his first production at the Opéra, M. Bizet would need to submit a work that offers the theatre better guarantees. With Ivan IV he will probably have a success at the Théâtre-Lyrique; at the Opéra he’d run the risk of a failure. This is the advice of M. Perrin, who has no desire to compete with the Théâtre-Lyrique in a manner that would be damaging both to the Opéra and to the young composer himself, who will be able to apply to our prime theatre at a later time with better weapons and in more favourable circumstances7. 8It was disingenuous of Perrin to claim that the opera was more suited to the other theatre than to his own. This is manifestly not true. He simply did not trust Bizet as a composer. Had Perrin heard the score or read the libretto? He must have forgotten that the libretto, by François-Hippolyte Leroy and Henri Trianon, had originally been intended for the Opéra some ten years earlier and offered to Gounod, who eventually abandoned it. Nor did Perrin comment on the quality of the music. With hindsight and with the brilliance of his later music in their minds, Bizet’s critics have been severe on Ivan IV, although it might reasonably be set alongside works by Gounod and Thomas which were staged at the Opéra in those years. His critics have been much harder on the libretto, with more reason, since it is far from favourable to Bizet’s gifts. Pigot believed that Bizet rejected the work from a feeling that he could not compete with Verdi, and it is certain that Verdi would never have tolerated a libretto such as this. Nonetheless, there is an irony in contemplating how Bizet’s career might have proceeded if Ivan IV had been staged at the Opéra in 1865 or 1866. 9 Lesley A. Wright, Georges Bizet: Letters in the Nydahl Collection, Stockholm, 1988, p. 10. 9Bizet was hugely discouraged by the Théâtre-Lyriques endless prevarication and the Opéra’s abrupt refusal: «I have been learning a tough lesson. I see disappointment and frustration all around, and cannot explain it. Whatever it is, LU put up with it all and keep fighting»8. On 28 December 1865 Bizet had a furious exchange with Carvalho, who attempted to eject him from a rehearsal of someone else’s work at the Théâtre-Lyrique. It ended with Bizet losing his temper and shouting «Carvalho, je vous tuerai!»9. 10Three years later the administration of the Théâtre-Lyrique passed into the hands of the conductor Pasdeloup, who was well disposed towards Bizet and asked him to submit Ivan IV for consideration. Bizet refused even to play it through to him. «Quelle triste musicien!» was his view of Pasdeloup10. 11One curious feature of the work stands out as an indication that Bizet had the Opéra in mind. No. 10, the Marche, scène et choeur, is a spectacular scene for the entrance of Tsar Ivan into the Kremlin cathedral. This is scored for full orchestra with an off-stage band comprising soprano saxhorn, two cornets, two trumpets, four trombones, bass saxhorn, contrabass saxhorn, percussion and bells. Such groups, always including saxhorns, had been a regular feature at the Opéra since Verdis Jérusalem in 1847. Meyerbeer’s Le Prophète had a scene with 24 players on stage, eighteen of them playing saxhorns, while the score of L’Africaine, first performed in 1865, calls for twenty saxhorns. The saxhorns in the score of Les Troyens are one of the indications that Berlioz had the Opéras resources in mind. There is no sign in the manuscript that Bizet rescored this scene when he submitted the opera to Perrin, so he was either deluded into thinking that the Théâtre-Lyrique could meet his requirements or he was all along imagining that this would be the work that would be his ticket to the Rue Le Peletier. 12The story of Ivan IV was greatly complicated in 1955 when Winton Dean, a passionate advocate for Bizet’s music, proposed the theory that the opera was composed for Baden-Baden in 1862-63, abandoning it when he had to compose Les Pêcheurs de perles in 1863, and revising it in 1864-65 for the Théâtre-Lyrique11. The argument rests partly on phrases in Les Pêcheurs de perles which reappear in similar form in Ivan IV, since Bizet, Dean argues, would have been unlikely to re-use material from an opera that had recently been performed and published. But the similarities are very brief, certainly not substantial self-borrowings. There seems to me to be no reason why echoes of one opera should not appear in the next. In any case the Baden-Baden theatre was small and seasonal; it could not possibly have undertaken a five-act opera on this scale. Recent scholars, including Lesley Wright, Rémy Stricker, and Hervé Lacombe, have accepted Dean’s dating, but without any documentary evidence to support it the theory must, I believe, be discarded. Ivan IV was composed when Bizet said it was, in 1864 (and perhaps early 1865) with one eye on the Théâtre-Lyrique and the other on the Opéra. 13Bizet took aim at the Opéra once more during his short life. In the spring of 1873 he was approached by Jean-Baptiste Faure, the leading baritone at the Opéra, to compose something for him. Faure’s impressive repertoire there had included major roles in Meyerbeer’s L’Africaine and Verdis Don Carlos, as well as Hamlet and Faust; he was also a notable Don Giovanni. Bizet could not lightly turn such an invitation down. He had just begun work on Carmen, as a follow-up to the one-act opera Djamileh, recently played at the Opéra-Comique, but he put it aside to draft Don Rodrigue, another five-act opera, with a libretto by Louis Gallet and Edouard Blau, after the play by Guillén de Castro y Bellvis (1569-1631) which was in turn the source for Pierre Corneilles Le Cid. The subject was suggested by Bizet himself. In September he wrote to Paul Lacombe: «This summer I’ve written Le Cid in five acts. It’s Faure who set this up. I’ll play his role through to him soon. If he likes it, there’s some hope of breaking into the grande boutique»12. The play-through took place at the end of October, with Bizet at the piano and his two librettists present, while Faure listened. What Bizet played from was a bundle of nearly 700 pages of music, set out as for a full orchestral score, but with only the vocal parts written in. The entire opera is drafted in this way, with only an overture and some ballet music left to compose. There are occasional indications of harmony and orchestration, but Bizet must have known exactly how he intended the work to Sound. This is the most tantalising of all Bizet’s many incomplete manuscripts. 14Two or three days later the Opéra in the Rue le Peletier burned to the ground. The company took up temporary residence in the Salle Ventadour for a year, while the Palais Garnier was completed. Did this débâcle cause the plan to be abandoned? Gallet, the librettist, who gave a full account of the collaboration, was convinced that Bizet’s youth and the inexperience of the two librettists were responsible for the abandonment of Don Rodrigue. Perhaps in the balance of history, it was a good thing: Bizet was able to complete the score of Carmen and thus guarantee his immortality. 15Again we find indications in the very incomplete score of Don Rodrigue that Bizet was familiar with the resources of the Opéra. The Marche et cortège which precedes the closing scene of the opera is the only part to have been fully scored, and it shows parts for an off-stage band consisting of two cornets, two trumpets, three trombones, three saxhorns (soprano, bass and contrabass), with harp and organ, almost exactly the same group that he had called for in Ivan IV. 16Parts of Ivan IV were played with piano accompaniment at the Théâtre des Champs-Elysées in 1943, during the war, and the first full stage performance was given in Bordeaux in 1951. Henri Busser was engaged to orchestrate the final scene, but he went far beyond that task in editing and restructuring almost every section of the work, so that the score published by Choudens the same year is, like so many scores of Bizet operas, a travesty. Since then the opera has been performed in Cologne, Berne, Liverpool, Bristol, Manchester and London, the later performances restored to something close to an authentic version by the conductor Howard Williams. 17As for Don Rodrigue, there is not enough in the manuscript to permit performance even with piano. The British musicologist Roger Nichols dreams of completing it, but he will have to have a special insight into Bizet’s harmony and scoring to achieve this, not to mention filling in the gaps where the voices do not sing. At such times Bizet has carefully set out the desired number of empty bars, but without any music. 18The same two librettists, Gallet and Blau, with some additional contributions from Adolphe d’Ennery, wrote Le Cid for Massenet in 1885. This version of the story is quite different, although a few lines are shared by both works. Debussy’s draft of an opera on the same subject, entitled Rodrigue et Chimène, from 1890-92, was unfinished, like Bizet’s, although much more of that opera survives. Richard-Langham-Smith’s reconstruction has been published in the Debussy edition, and the work was staged in Lyon in 1993. Its libretto is by Catulle Mendès. 19Bizet’s early death is one of the greatest tragedies of musical history. Unlike Mozart and Mendelssohn, his genius was not displayed in childhood but emerged slowly and fitfully. Their early deaths are not so tragic as Bizet’s. Wagner and Verdi, like Bizet, approached maturity slowly, but they both lived to a great age. Bizet’s last works, especially L’Arlésienne, Jeux d’enfants, and Carmen show extraordinary promise of a richly productive maturity that Bizet never knew. If Ivan IV had been staged at the Opéra in the 1860s and Don Rodrigue in the 1870s, Bizet’s story would much more closely resemble that of Thomas or Gounod. But as it was, he composed Carmen instead. 20It might be said that once the Opéra moved to the Palais Garnier in 1875 it lost its leadership in the European sphere in comparison with the glory it enjoyed in the Rue Le Peletier. Bizet scarcely knew the institution in its new building, but it might have been the place where the great works of his middle and late years would have dazzled the world. 1 « Qu’ils soignent un peu leurs idées, qu’ils recherchent la mélodie fraîche et franche [...], et ils pourront, l’un et l’autre, grimpant de degré en degré, gagner le Théâtre-Lyrique, puis l’Opéra-Comique, puis l’Opéra, ce sommet du Parnasse musical qu’atteignent seulement les plus hautes renommées. » L’Union, 24 April 1857, after Le Docteur Miracle, cited in Hervé Lacombe, Georges Bizet, Paris, 2000, p. 166. 3 « [Après Les Pêcheurs de perles] Carvalho m’a immédiatement commandé un Ivan IV en cinq actes qui n’a pu, pour une foule de raisons, être représenté. » Henry Malherbe, Carmen, Paris, 1951, p.50. 4 « Le Théâtre-Lyrique, après l’opéra de Gounod, Mireille, [...] monterait, dit-on, un grand ouvrage, Yvan le Terrible, [...] dont la musique serait maintenant confiée à M. Georges Bizet ». Le Figaro, 10 March 1864. 5 « Lo Bizetto del Vezinetto: il travaille toujours à son Ivano quarto, ossia il terribile ! ! ! ». Charles Gounod to Hébert, 14 October 1864, in H. Lacombe, Georges Bizet, p.327. 7 « J’ajoute que, par son sujet même, cet Ivan IV a plus de chance de succès au Théâtre-Lyrique qu’à l’Opéra. Bien jeune encore, M. Bizet aurait besoin, pour arriver d’emblée à l’Opéra, d’un ouvrage qui offrît plus de garanties au théâtre. Avec Ivan IV, il réussira sans doute au Théâtre-Lyrique; à l’Opéra il risquerait fort d’échouer. [...M. Perrin] n’est nullement disposé à faire au Théâtre-Lyrique une concurrence dangereuse pour l’Opéra et pour le jeune auteur qui pourra se présenter plus tard sur cette première scène avec des armes plus sûres et dans des conditions plus favorables. » Letter from Doucet to the ministre des Beaux-Arts, 11 Dec. 1865, BNF, département des Manuscrits, NAF 14346, fol. 34. 8 « Je fais une rude école en ce moment. Les déboires, les froissements se multiplient autour de moi sans que je puisse en deviner la cause. Soit, je supporterai tout, je lutterai contre tout ». Bizet to Choudens, Jan. 1866, copy at BmO, LAS Bizet, n°11. 10 « Quant à Pasdeloup, je n’ai même pas pris la peine de lui faire entendre Ivan qu’il désirait beaucoup connaître ». Bizet to Marie Trélat (? ), Feb. 1869, in L. A. Wright, Georges Bizet..., p. 25. 11 Winton Dean, «Bizet’s Ivan IV», in Fanfare for Ernest Newman, ed. Herbert Van Thal, London, 1955, p. 58-85, reprinted in Winton Dean, Essays on Opera, Oxford, 1990, p. 262-280. 12 « J’ai fait cet été un Cid en cinq actes. C’est Faure qui m’a lancé dans cette affaire. – Je vais lui faire entendre son rôle un de ces jours. Si la chose lui plaît, il y aura espoir d’arriver à la grande boutique ». Hugues Imbert, Portraits et études, Paris, 1894, p. 194. MACDONALD, Hugh. Bizet’s aspirations to the Opéra In : Le répertoire de l’Opéra de Paris (1671-2009) : Analyse et interprétation [en ligne]. Paris : Publications de l’École nationale des chartes, 2010 (généré le 20 avril 2019). Disponible sur Internet : <http://books.openedition.org/enc/452>. ISBN : 9782357231078. DOI : 10.4000/books.enc.452. Macdonald, Hugh. “Bizet’s aspirations to the Opéra”. Noiray, Michel, et Solveig Serre. Le répertoire de l’Opéra de Paris (1671-2009) : Analyse et interprétation. Paris : Publications de l’École nationale des chartes, 2010. (pp. 85-90) Web. <http://books.openedition.org/enc/452>. NOIRAY, Michel (dir.) ; SERRE, Solveig (dir.). Le répertoire de l’Opéra de Paris (1671-2009) : Analyse et interprétation. Nouvelle édition [en ligne]. 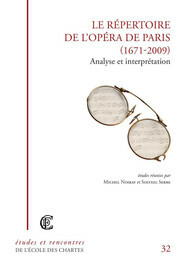 Paris : Publications de l’École nationale des chartes, 2010 (généré le 20 avril 2019). Disponible sur Internet : <http://books.openedition.org/enc/424>. ISBN : 9782357231078. DOI : 10.4000/books.enc.424. Noiray, Michel, et Solveig Serre, ed. Le répertoire de l’Opéra de Paris (1671-2009) : Analyse et interprétation. Paris : Publications de l’École nationale des chartes, 2010. Web. <http://books.openedition.org/enc/424>.